By attending this class you will learn the latest in electrical safety standards and regulations. This training will help you become a great electrical safety instructor. You will teach workers how to be more aware of the hazards and how to reduce the risk. This course reflects the evolution of NFPA 70E in the direction of risk assessment and hazard elimination. The hierarchy of risk controls will be discussed in a way that can be applied right away. Shock and Arc Flash hazard PPE selection is covered in detail. You will learn how to use real-world scenarios and OSHA citations as learning tools. OSHA 1910 as well as NFPA 70E will be discussed. We can incorporate your facility’s electrical safety program, arc flash incident energy analysis report and equipment labeling, into the class if you’d like. Attendees will walk out of this class better prepared share what they have learned. 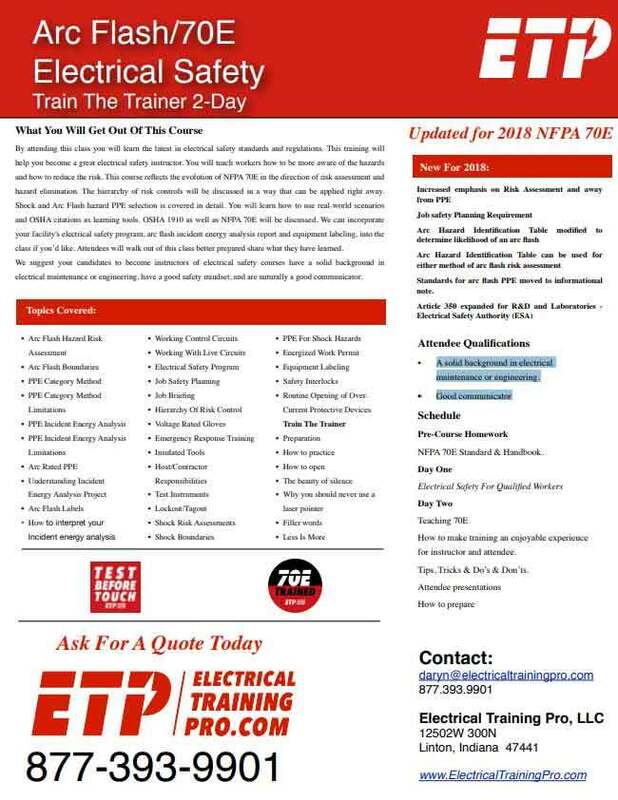 We suggest your candidates to become instructors of electrical safety courses have a solid background in electrical maintenance or engineering, have a good safety mindset, and are naturally a good communicator. This Course Covers Those Things Management Personnel Most Know Concerning Managing Qualified Electrical Workers. How to make training an enjoyable experience for instructor and attendee. Tips, Tricks & Do’s & Don’ts. Standards for arc flash PPE moved to informational note. A solid background in electrical maintenance or engineering. Why you should never use a laser pointer.